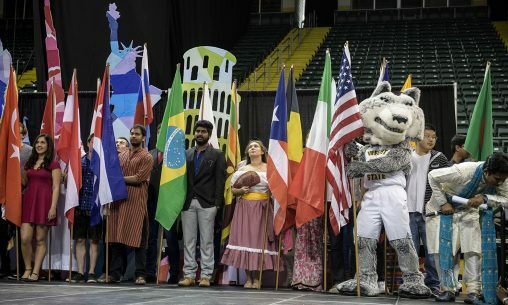 “Trip Around the World” will be the theme of this year’s Wright State International Festival, which is celebrating its 35th year. The festival will be held on Saturday, April 27, from 1 to 4 p.m. in the Student Union Atrium. It is free and open to the campus community and public. The festival will feature cultural performances, including a flag parade, a Chinese dragon dance, Scottish dancers, a Mexican folklore ballet, cloggers and a cultural fashion show. There will also be an international photo booth, a Snapchat filter and raffle prizes. Middle Eastern and Indian food will be available. Two people will be honored with awards during the festival. The International (Student/Scholar) Advocate Award will be presented to a Wright State faculty or staff member or a Dayton-area community or group member who has been instrumental in improving the experience of Wright State international students and scholars during their studies. The Global Citizen Award will go to an outstanding international student, a Wright State Exchange Visitor Program scholar (researcher/professor) or a U.S. domestic student who through service and leadership at Wright State, in the Dayton community or abroad has been instrumental in improving the experience of other Wright State students on campus, in the community or on one of Wright State’s exchange or study-abroad programs. For more information, visit the University Center for International Education website.